These photos are in MrSID format and Montana State Plane coordinates, units meters, datum NAD83. The photos are three-band images with the visible wavelengths. Each image is about 30 megabytes in size. The State Library offers two web services that allow these images to be viewed without the need to download files. One of the services shows natural color imagery and the other shows false-color infrared. The infrared version of the imagery was collected partly in 2005 at the same time as the natural color imagery and partly in 2006. 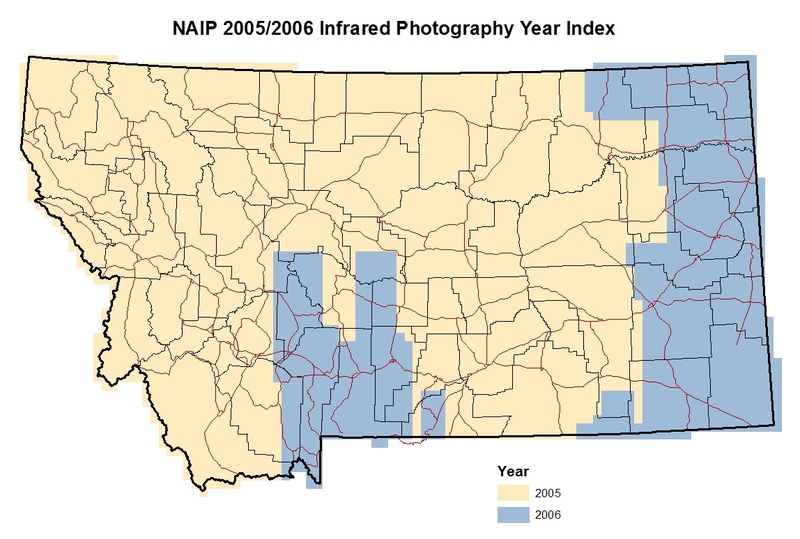 This map shows which infrared imagery was from 2006. We do not have specific dates for the 2006 images. The US Dept of Agriculture has services with the latest nationwide photos at http://gis.apfo.usda.gov/ArcGIS/rest/services/NAIP.